I had received the Twist n roll Tweezers and the SwirlyDo hair ties from Lindo. What exactly is a Twist n roll Tweezers? You know those lovely little hairs women get on their face that some seem a little more visible than others but they are so fine that tweezing them would take all day? Well the Twist n roll Tweezers help cut the time to days to seconds, basically you place the tweezer on your face, roll and thats it! The spring like device grabs the fine hairs and wraps them up as you go along your face giving you a clean feel now that the fine hairs are removed! How great and it doesn't hurt like what doing one hair at a time would. The other is the SwirlyDo which are plastic rings which you place in your pony tail when removed they will not leave that lovely dent in your hair it will come out smooth. The SwirlyDo's come in many colors! Each pack has 5 colors to mix and match with your outfits. Works on all types of hair. My daughter also loved them as fun colorful bracelets. Lindo also carries massagers, headbands, feather pieces and more. You can check out all of Lindo's products here. 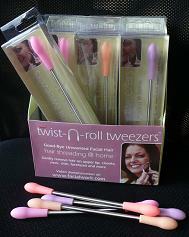 Disclosure: I was given the Twist n Roll Tweezers and SwirlyDo's to help with my review. All opinions are 100% mine.